A meeting of free minds and free markets in a great city burdened by the heavy hand of the state. 1. 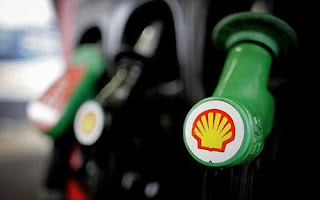 Global supply (which have been reduced due to conflicts in the Middle East and the Gulf Spill) and demand (which has risen primarily due to economic growth in China and India) are the primary factors that drive prices. 2. While speculation is a factor, American Petroleum firms (to the best of my knowledge) are not allowed to engage in it. Furthermore, speculation is largely a response to anticipated drops in production. 3. Government taxation must be taken into account; rapacious Chicago has the highest cost of gas in the country, $4.27 versus the national average of $3.88. So, why do so few people complain about "greedy government"? And when the government institutes price controls to make gasoline "affordable," shortages always ensue. 4. Although there may environmental benefits to limiting where we can drill, this limits the growth in supply, which results in higher costs. Whether this equals a net benefit or net burden is up to each individual to decide. 5. I did the math and if we take the conservative estimate of $1.00 for a 12 ounce bottle of water, the cost of bottled water is $10.65 per gallon! Keep in mind that some firms fill their bottles with tap water, whereas the gas in your car must be: drilled (from miles beneath the earth) from a field using very costly equipment, transported hundreds or even thousands of miles, refined and then once again transported to the gas station. 6. For various reasons a company's or industry's profit margin is more relevant than the actual profit. Surprisingly, the petroleum industry was ranked 7th among profit margins. On average "greedy" oil companies" earned an 11.5% margin, whereas "progressive" railroads earned 12.6% and telecommunication equipment firms enjoyed a whopping 20.4%. 7. Rising costs provide firms the incentive, as well as the capacity to invest billions in exploring new sources of petroleum to meet rising demand. 8. Rising stock prices and dividends of petroleum firms have kept many pension and retirement plans solvent. 9. As the cost of gas rises, so do incentives to: purchase fuel efficient and environmentally friendly cars, use public transportation, choose a smaller home that is closer to work (rather than a McMansion in the distant suburbs) and (last but not least) to develop viable alternative sources of energy. 10. History shows that just as oil costs and profits rise, so shall they fall. The heated rhetoric of politicians and misguided state intervention may sway voters, but they do nothing to ensure the continued flow of petroleum that is vital to every segment of the American Economy; that is the job of the "evil oil companies." Last week the "Big Five" oil companies reported what could only be called healthy profits, what averages out to be a 35.6% increase in profits over the first quarter of last year. One company, ExxonMobil, reported a 69.8% increase in profits over last year in this quarter. 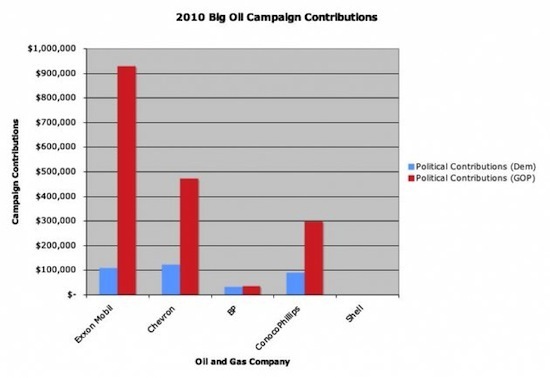 According to Public Campaign, the Political Action Committees for BP, Chevron, ConocoPhillips and ExxonMobil donated $285,500 to elected officials and political parties in the first quarter of 2011. "These profit reports show Big Oil is making big bucks from high gas prices at the pump," said Checks and Balances Deputy Director Matt Garrington. 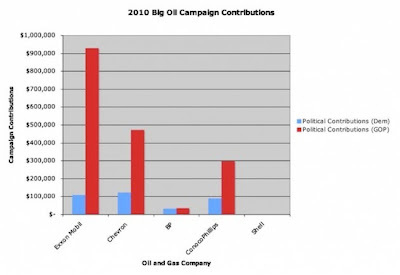 "Big Oil spent $63 million lobbying Congress and $2 million in campaign contributions last year so politicians would hand out $4 billion every year in taxpayer-funded subsidies." Public pressure is starting to sway GOP members of Congress. Speaker John Boehner, Denny Rehberg, Sam Graves, Mick Mulvaney, and Paul Ryan are all on record, stating the need to end oil and gas subsidies. On the other hand, oil and gas money recipients, including Natural Resources Committee Chairman Doc Hastings (R-WA-04) and Subcommittee Chairman Doug Lamborn (R-CO-05), recently voted against ending "royalty relief" for offshore drilling companies. Hastings and Lamborn are also leading the charge to open up even more Western lands drilling despite the fact that Big Oil and Gas has failed to develop 57 percent of public lands leased for drilling. Those Republicans know which side their bread is buttered on, but as the political oil subsidy fight heats up—along with increasing anger over the Republican budget plan and it's big tax breaks for the rich and for corporations—voters might actually be in a mood to just remove the bread from that scenario.